I can't tell you how many ways there are to install a hardwood floor, The few I'm going to list here will be the most popular methods for residential purposes only. The Type of Subfloor you have will determine what the Installation method will be. There are many ways to enhance your hardwood floor. Some of the less expensive ways to add some bling to your hardwood floor would be adding a simple border made from feature strips, or single pieces of a different colored hardwood (shown right). Doing a border at the front door would add a nice accent, or a picture frame around a fireplace hearth. 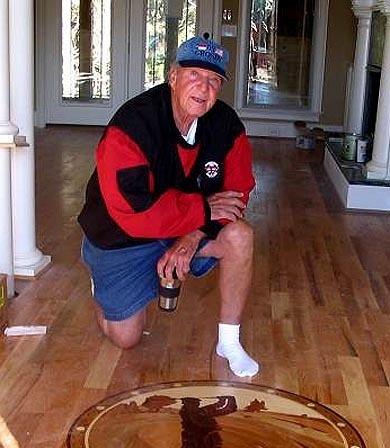 There are a lot of inexpensive ways we can add some serious wow factor to your floors that include pre manufactured CNC router or lazer cut medallions and borders. Most people don't even know this stuff exists. With these types of borders and medallions your floors will be the talk of the town and doesn't really break the bank either. If your pockets have no bottom, we can hook you up with floors that look like they belong in a palace. Some of the different parquet patterns available today will blow your mind. One of my favorites is a three dimensional floor that looks like you could trip over blocks sticking out of the floor. 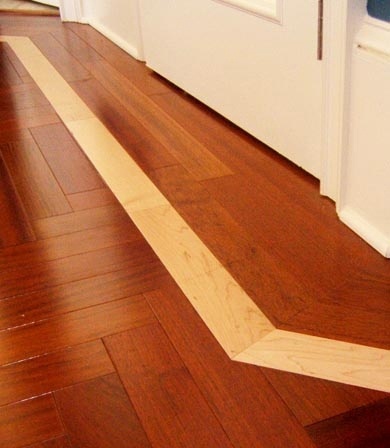 Maple Border - Feature strip installed with prefinished Brazilian Cherry herringbone design. Bloomfield Hills. Golfer Medallion - Installed in the foyer of a home in Huntington Woods. Sand and finish.